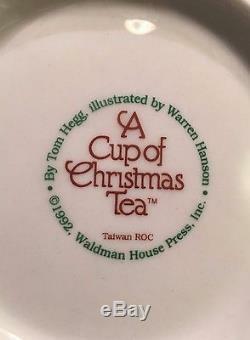 " A Cup of Christmas Tea" by Waldman House 1992. Inspired by Tom Hegg's Poem. 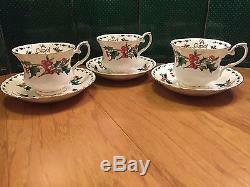 8 Footed Cup & Saucer Sets. This amazing set is new! 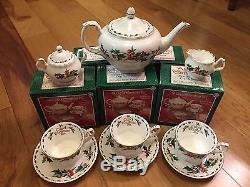 Five teacups and saucers are NIB. Everything else is new without original boxes. One of the cups w/o a box still has a quality control sticker on it. 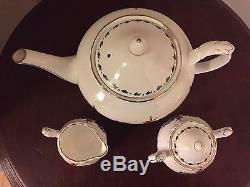 This is NOT the miniature or children's tea set. If you're wondering if this is a good deal, check prices on Replacements, Ltd. Last check the creamer and sugar were not available. 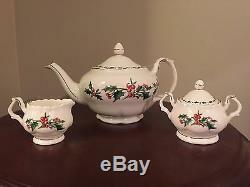 White With Green Holly, Red Berries, Gold Trim. 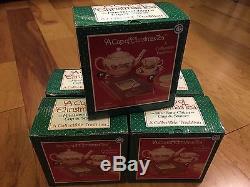 A Cup of Christmas Tea. The log was in the fireplace. All spiced and set to burn. At last the yearly Christmas race. Was in the clubhouse turn. All the gifts beneath the tree. Could catch up with me. Seemed the order of the day. Something still was nagging me. And would not go away. A week before, I got a letter. From my old great Aunt. It read: Of course I'll understand. Completely if you can't. But if you find you have some time. Could have a little chat and share. 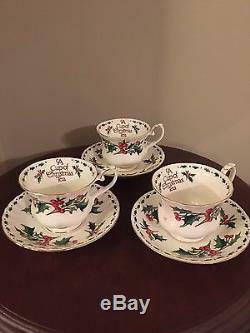 A cup of Christmas tea. She'd had a mild stroke that year. Which crippled her left side. It hadn't hurt her pride. They said: She'd love to see you. What a nice thing it would be. For you to go and maybe have. I didn't want to go. Oh, what a bitter pill. To see an old relation and. How far she'd gone downhill. I remembered her as vigorous. As funny and as bright. I remembered Christmas Eves when. She regaled us half the night. I didn't want to risk all that. I didn't want the pain. I didn't need to be depressed. I didn't need the strain. And what about my brother? She's his aunt, too! I thought I had it justified. But then before I knew. The reasons not to go I so. Were cracking wide and crumbling. In an acid rain of guilt. I put on boots and gloves and cap. I went out my front door. I drove in from the suburbs. To the older part of town. The pastels of the newer homes. Gave way to gray and brown. I had that disembodied feeling. As the car pulled up and stopped. That held the Christmas cup. How I got up to her door. I really couldn't tell... I watched my hand rise up and press. The button of the bell. I waited, aided by my nervous. And just as I was thinking. I should turn around and go. I heard the rattle of the china. In the hutch against the wall. The triple beat of two feet. And a crutch came down the hall. The clicking of the door latch. And the sliding of the bolt. And a little swollen struggle. Popped it open with a jolt. She stood there pale and tiny. Looking fragile as an egg. I forced myself from staring. At the brace that held her leg. And though her thick bifocals. Seemed to crack and spread her eyes. Their milky and refracted depths. Lit up with young surprise. She took me by the hand. And all my fears dissolved away. As if by her command. We went inside and then before. I knew how to react. Before my eyes and ears and nose. Was Christmas past, alive, intact! The scent of candied oranges. I'd always loved so much. The Dresden and the crystal. I'd been told I mustn't touch. Like a child out of class. And danced among the ornaments. Like magic I was six again. Deep in a Christmas spell. Steeped in the million memories. That the boy inside knew well. And here among old Christmas cards. A special place of honor. For the ones we kids had made. And there, beside her rocking chair. The center of it all. My great Aunt stood and said how nice. It was I'd come to call. I sat and rattled on about. The weather and the flu. Then smiled and said, What's new? Thoughts and words began to flow. I lost the phony breeziness. I use when I get tense. She was still passionately interested. Like when I was a kid. Still sent her into fits. We talked about the limitations. That she'd had to face. She spoke with utter candor. And with humor and good grace. Of crutch and straightened knee. She flew to brew the tea. I sat alone with feelings that. I hadn't felt in years. I looked around at Christmas. Through a thick hot blur of tears. And the candles and the holly. She'd arranged on every shelf. She still somehow baked herself. But these rich and tactile memories. Became quite pale and thin. When measured by the Christmas. My great Aunt kept deep within. Her body halved and nearly spent. But my great Aunt was whole. I saw a Christmas miracle. The triumph of a soul. The triple beat of two feet and a. Crutch came down the hall. The rattle of the china. She smiled and then she handed one to me. And then we settled back and had. 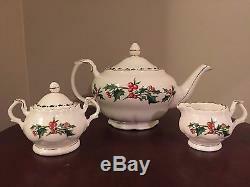 The item "Cup of Christmas Tea Teapot Sugar Creamer Cup Saucer Set Tom Hegg Waldman House" is in sale since Monday, February 20, 2017. This item is in the category "Collectibles\Holiday & Seasonal\Christmas\ Current (1991-Now)\Other Current Christmas Décor". The seller is "whointheworld" and is located in Spartanburg, South Carolina.